Cook rice noodles according to package instructions. Drain and rinse with cold water. Set aside. Soak 1 wrapper in a shallow dish (I used a dinner size plate) of water for 30-45 seconds or just until pliable (if soaked too long, it will fall apart). Lay on a paper towel to drain. Lay 2-3 shrimp (tails removed) about 2 inches from the edge of wrapper. Top with 1/4 cup of greens, a couple slices of peppers, a couple slices of cucumber, a couple basil leaves, and about a 1/4 cup of noodles, but I think it’s safe to say, that eyeballing is good way to go here. 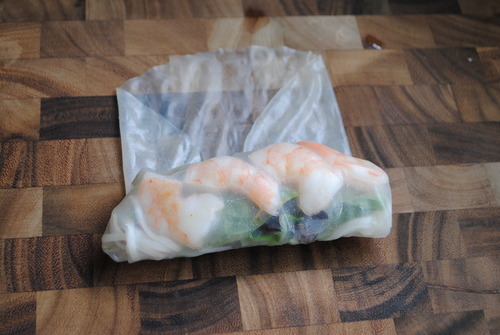 Fold in sides of rice wrapper and roll tightly away from you (you’ll see a picture). Repeat soaking and stuffing procedures with remaining wrappers and filling. 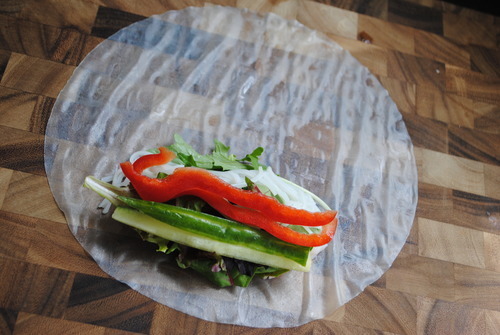 Slice diagonally into 2 pieces. 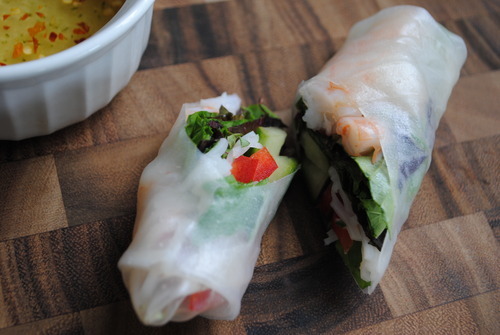 Serve with Sweet and Sour Chili Sauce. Combine all ingredients in a small bowl and whisk until sugar dissolves. Store refrigerated in an airtight container until ready to serve or up to 2 weeks.